The August issue of Civil War News — on of the few publications I read from cover to cover — includes a generous review of Faces of the Confederacy by Michael J. Winey, familiar to many historians as a curator (now retired) at the U.S. Army Military History Institute in Carlisle Barracks, Pa.
My favorite part of Mike's review: "It is a book that you just want to read one more story before you put it down, and then you want to read one more." I also like this quip: "Those of you who are Yankee lovers only probably won't want to dirty your hands holding this very Southern-oriented book! For myself, I was pleased with each and every image printed so I never needed to wash my hands." 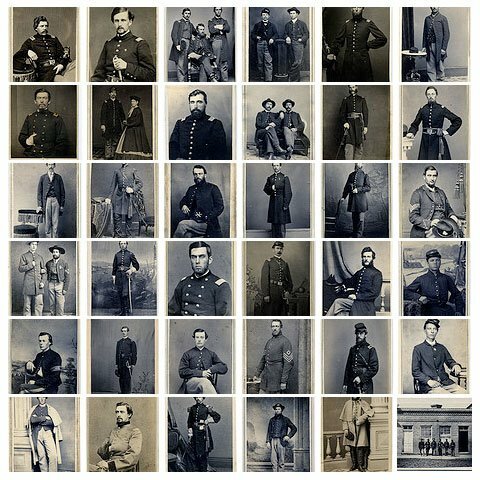 The Faces of War column scheduled for this month's issue of the Civil War News was cut due to space limitations. A wealth of news and information, plus book reviews and the annual fundraising directory, forced its postponement. Faces of War will return next month. 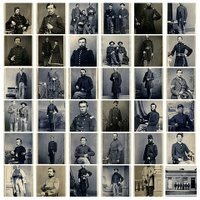 An alert Flickr member, bch10, saw my carte de visite of 1st Lt. Robert S. Robertson of the Ninety-third New York Infantry, and left a comment that included a link to a Library of Congress image of the regiment's officers and non-commissioned officers, noting that Robertson sat front and center. I downloaded the high-resolution, archival version of the image from the LOC (use this link, then enter call number LC-B817- 7515) and enlarged it to see the detail. I instantly recognized two of the other officers in the group, sending shivers through me. The second man seated to Robertson's left is Capt. Dennis Edwin Barnes of Company C, who died in action during the Battle of the Wilderness. His image is in my Photostream. 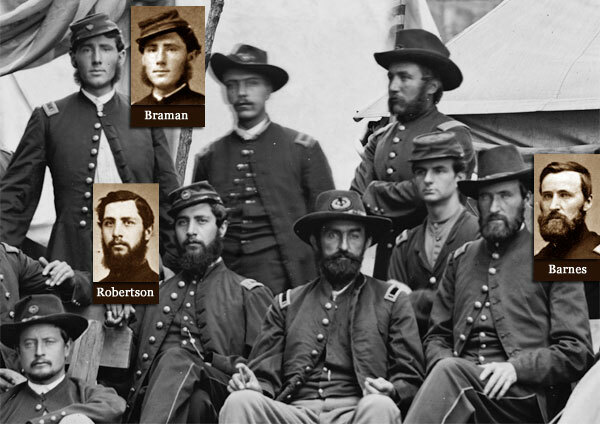 The officer with the sideburns standing behind Robertson's right is 1st Lt. Waters Whipple Braman of Company H. Braman later became a captain, and served as an aide-de-camp to generals David Birney and Gershom Mott. Braman's photo is not in my Photostream, but is included in Union Faces. Robert Stoddart Robertson left the Ninety-third to become an aide-de-camp to Brig. Gen. Nelson A. Miles in December 1863. Five months later, during the Wilderness Campaign, near Corbin’s Creek, a Confederate charge broke the Union line. Robertson rallied the men, turned back the enemy attackers, and later received the Medal of Honor for his actions. Three weeks later, at Totopotomoy Creek, while carrying orders to a front line position, he suffered a serious leg wound that ended his military service. After the war he settled in Fort Wayne, Indiana, and served as lieutenant governor from 1886-1888. His full profile will appear in an future issue of Civil War News. A detail of the LOC image is shown here. Sepia-toned portraits from my collection overlay it. (Note: The Barnes image was part of my collection for a short time. Purchased on eBay from Daniel Lorello, it has since been returned to the state of New York).